A few years ago we designed a collection titled “Quilt Labels” that allowed you to add the perfect finishing touch to a quilt by adding an embroidered label. 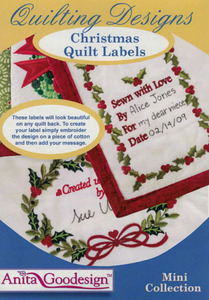 Since we create so many embroidered gifts for Christmas and a lot of those gifts are quilts we decided to design quilt labels specifically for Christmas! This collection has 20 Christmas themed frames that will finish your quilt perfectly. You can add your name to the labels using a fabric marker or you can merge lettering from your machine. Whichever method you choose to finish your quilt you will love these designs.